contains 32.15 ounces of .9999 pure gold. Each bar is handcrafted and buffed and stamped with the Heraeus logo and serial number. 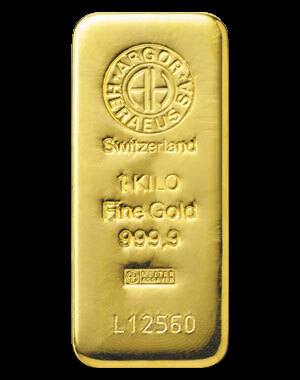 The Heraeus kilo gold bar offers one of the best values in gold bullion. Multiple kilo bar purchases guarantee the absolute best value in gold bullion available anywhere. Liberty Gold and Silver offers multiple bar purchases at the lowest prices in the industry. Call for a quote. The 150 year old Heraeus brand is one of Europe’s oldest precious metals refinery and commands respect throughout the world bullion industry.